Today we re-enter the realm of perspective-altering photographs, images that open new vistas in our early reconnaissance of the Solar System. Before October 7, 1959, we had little knowledge of the far side of the Moon, even though librations allowed the occasional glimpse at extremely low angles of a small part of it. 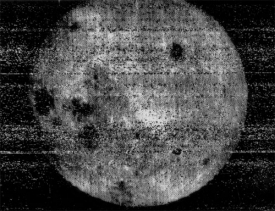 The Soviet moon probe Luna 3 took the first photographs of the far side, and was followed by the much better imagery of Zond 3 in 1965. NASA’s Lunar Orbiter program would continue the mapping as the 1960s progressed. Image: First glimpse. The view of the Moon’s far side from Luna 3. The far side would swim into vivid focus, of course, when Apollo 8 and subsequent missions took astronauts to the Moon, but it was up to the China National Space Administration to make the first soft landing there on January 3 of this year (Ranger 4 had impacted on the far side in 1962, but without returning data before impact). Working in this environment demanded a relay satellite to support communications with the Chang’e 4 mission on the surface. The Queqiao satellite handles signals from the surface and relays them to Earth, working with a satellite called Longjiang-2, from which the image below was downloaded on February 3. Remember, for most of human history, we had no idea what the far side of the Moon looked like. Now we’ve not only mapped it, but can see a view of Earth with the entire far side laid out before us. 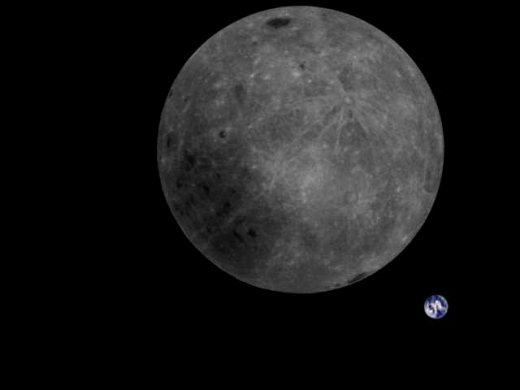 Image: Downloaded at the Dwingeloo Radio Observatory in the Netherlands, this view from Longjiang-2 shows the Earth and the Moon’s far side. The contrast in color is reminiscent of Bill Anders’ famous shot from Apollo 8, though here we see the Moon in its entirety. Another perspective changer is the fact that Longjiang-2 is equipped with an amateur radio transceiver that allows radio amateurs to downlink telemetry and relay messages through it, as well as commanding it to take and downlink images, as explained in this page at the Dwingeloo website. What an opportunity for space-minded amateurs. They can work Longjiang-2 (call sign BJ1SN) and join the amateur team at Dwingeloo itself (PI9CAM) to see images that, not all that long ago, would have seemed astonishing. For many of us, ‘astonishing’ still applies. I can’t leave the far side without comparing the above to the animation below, a spectacular shot of of the Earth and Moon as seen by the DSCOVR satellite (Deep Space Climate Observatory). Image: This animation features satellite images of the far side of the Moon, illuminated by the Sun, as it crosses between the DSCOVR spacecraft’s Earth Polychromatic Imaging Camera (EPIC) and telescope, and the Earth — 1.6 million km (1 million miles) away. The times of the images span from 3:50 p.m. to 8:45 p.m. EDT on July 16, 2015. The time of the New Moon was at 9:26 p.m. EDT on July 15. Credit: NASA/NOAA. Another perspective enhancer is the view below from MARCO-B, nicknamed WALL-E. Along with MARCO-A (also known as EVE), the CubeSat made it to Mars in a seven-month journey that provided data on the InSight landing on November 26, 2018. The data were valuable because Mars orbiters could not observe the entire landing sequence and route information swiftly back to Earth. The MARCOs returned data at each stage of the InSight descent and landing in near-real time, also beaming back InSight’s first image. And despite the failure of MARCO-A’s camera, MARCO-B succeeded in fine fashion with the memorable animation below. Image: MARCO-B, one of the experimental Mars Cube One (MARCO) CubeSats, took the images shown in the animation above as it approached Mars from about 575,000 kilometers (357,300 miles) to 18,000 kilometers (11,200 miles) away, just before NASA’s InSight spacecraft landed on Mars on Nov. 26, 2018. MARCO-B flew by Mars with its twin, MARCO-A, to serve as communications relays for InSight as it touched down on the Red Planet. Nicknamed WALL-E, MARCO-B took these images on Sunday, Nov. 25 and Monday, Nov. 26, 2018. The bright point of light to the left is the corner of MARCO-B’s high gain antenna feed and to the right is the high gain antenna, which let the CubeSat communicate with Earth. In this animation, Mars is spinning on its axis from right to left. Credit: NASA/JPL-Caltech. This summer the two diminutive spacecraft will begin moving back toward the Sun. MARCO-A is, based on calculations of its trajectory, now more than 3.2 million kilometers beyond Mars, while MARCO-B is 1.6 million kilometers past the planet. Further attempts to communicate with the CubeSats will be made later this year, but it’s not known how long the batteries and other parts of the spacecraft will last. Whether we hear from either again or not, the MARCOs have pushed the paradigms of size and cost and pointed the way to future missions, perhaps one day involving solar sails and networking technologies taken all the way to the outer planets. China has all but shut down to welcome the Year of the Pig and Yutu-2 is taking a precautionary midday nap, but the Chang’e-4 mission is still sending us some new and brilliant footage from its various spacecraft — while also being snapped by NASA’s Lunar Reconnaissance Orbiter. NASA’s Jet Propulsion Laboratory says it does not expect to receive any more transmissions from the MarCO CubeSats that accompanied the Insight lander to Mars last year. The two tiny spacecraft, which relayed Insight’s descent signal back to Earth in real time, have not been heard from in more than a month. Don’t forget the LRO hi-res map of the lunar north pole. Resolution is 2m/pixel! These new maps make my dead-tree lunar atlases in my library look downright Victorian. It seems to me that if we could map teh whole moon with high-resolution images, and maintained monitoring via orbiters, we could easily detect meteor impacts almost in real time. Computational scanning of the images should identify new craters very quickly. Maybe other feature changes, such as possible vulcanism might also be detectable. Earth is struck by meteors every day that explode in the high atmosphere. Detecting such impacts on the Moon would make it seem less like an unchangeable world. Analyzing the impact plumes might even offer useful information on the subsurface geology, as well as water content below the surface. Wow, my family name is Karpin, I think probably derived from Karpinskiy when that part of the family moved from Lithuania to Australia. First zoom image is Karpinskiy crater! A big one. So cool. I bags it. It’s got my name on it. From all appearances here, it looks as if took the animation videos of MARCO-B from the perspective of MARCO-B getting ready to pass in front of the planet Mars. Was that in fact the case? The new research does not take sides as to whether the liquid water exists. Instead, the authors suggest recent magmatic activity – the formation of a magma chamber within the past few hundred thousand years – must have occurred underneath the surface of Mars for there to be enough heat to produce liquid water underneath the kilometer-and-a-half thick ice cap. On the flip side, the study’s authors argue that if there was not recent magmatic activity underneath the surface of Mars, then there is not likely liquid water underneath the ice cap.